Recently, I was contacted by Artist and creator, Tyrone Webb, wanting to share some of his artistic and life story. I was moved that Tyrone would want to share such a delicate piece of his story with weourstory, and my audience. Tyrone is an artist with a unique approach to painting. 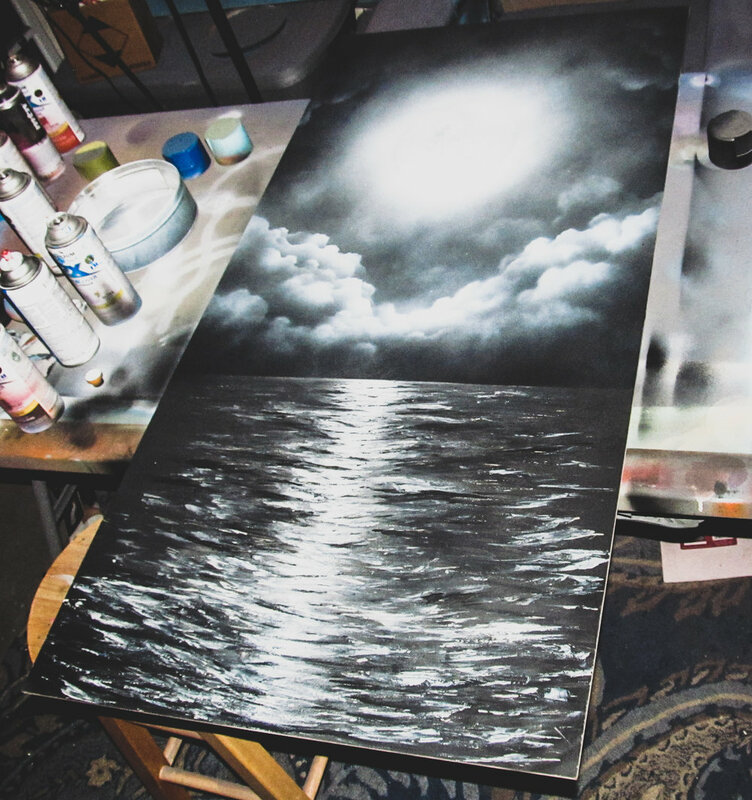 Tyrone relies solely on spray paint to create beautiful art pieces. He is currently working towards writing and illustrating a children's book using only spray paint. As you read his story, you'll find out why he's pursuing this and what inspired him to do so. Almost 3 years ago, daughter, who was 6 at the time and I were forced to endure a major change in our lives. A difficult dissolution. A better description would be an explosion of our family as we knew it. In a single instant all of my priorities in life were reduced to just her. In 2012. I had already spent almost 20 years in the corporate IT world, 14 of them with IBM. However, I had become what has been referred to as "soul sick." So I started painting with spray paint to relieve the stress and calm my mind. I became quite good at it. It was a nice little hobby I had for myself in the garage. During this period I was married to a woman I trusted and loved and believed her support for me was there. In time that became less and less of a reality. In 2013, one year after starting to paint, I was Laid off from IBM. Although I was very worried, I felt a sense of freedom wash over me. It was as if I was being given the space to become who I was meant to be. So I began using my business and project management skills to begin a career as an artist. I had found what I wanted to do for the rest of my life. I took a risk and invested my severance and 401k into retooling my skills through education and reinvention--I dove head first into one of the hardest careers to get off the ground--Art. I had many art accomplishments. Including a couple showings, exposure, sales, interviews and commissions. I even got a new job in Art. As I was starting to see real potential and hope, in 2015, it happened. Simply put, in one horrific instant I was replaced as a husband and my daughter was left without a mother. I was completely destroyed and my daughter's world was ripped to shreds. Each night, the impact this was having on my daughter was becoming more and more evident. Nightmares and coping behaviors suddenly emerged as well as self esteem issues. All of these manifested in as little time as a week as the permanency of the change set in. We had to endure her birthdays, Thanksgiving, and Christmas within this surreal environment of just her and I. On top of it all, I lost my job and our car died. It was the darkest time in my life. Every morning, I had to hide my own worries and pain from my daughter as I got her ready for school. My days would be filled with nothing but dread. My nights were filled with sudden wakes by her crying. It was daunting to say the least. For 2 months i spent a lot of time trying to help my daughter cope with her feelings as I tried to put my soul back together. Then I realized that my best course of action would be to sanitize her life and start mine over. So we packed up as much of our lives as we could (including the dog we rescued on her birthday), and put it all into a small towed trailer. My plan was to move from Colorado back to my hometown in Pennsylvania and move in with my father. It was there where I would climb out of the deep, dark, hole I begin a fresh start. I was also comforted that my daughter would have family to help her as well. After we settled in, I got her into therapy and started doing all of the standard practices recommended to help her. Because they weren't making progress with her, I had to come up with an alternative. It was here that I remembered something. The night we were leaving on our cross country trip, she suddenly came to me in tears and started sharing her thoughts about the move. She applied so much detail to it. She talked about the colors she saw, how the sky looked, and even what the air smelled like. The real fear in my six year old daughter's description caused me to fight back my own tears. The interesting thing is that I saw a painting emerging in my head. I saw how I could transform that image she described into something else. So we went outside, looked up at the night sky and I started changing what she saw by explaining how it could be different. Using the same detail my daughter used, I waved my hands through the air as if I was painting something new for her. It worked! It calmed her down and even put a smile on her face. We climbed into the car and set out on our 30 hour, 1800 mile adventure. Along our drive, we'd engage in this "Imagination Exercise," and created a fantastic world as a coping mechanism for her fear. For 2 years since that move, we have had many ups and downs. However, I came to terms with my current life. I am divorced. I have primary custody of my daughter. I have a place for us to live. I have a simple job. Amazingly, I am still painting. I've had two solo gallery shows and two TV interviews. I even scratched off a bucket list item by being selected to hang a painting in NYC. Together, we have overcome many challenges and we engage the "Imagination Exercise" even to this day. I recently had an epiphany and with the help of a friend, realized something: There are probably many other single parents out there dealing with much of the same issues with their children that I went through. I decided i would give back by showing others what i had learned. I have decided to write and illustrate a children's book using only spray paint. As far as I've researched, it has never been done. Have you seen one? I am going to tell our story of how we overcame fear and change with hope and wonder. I want to recount several of the situations my daughter was afraid of and express them as a pictures. I want to create paintings of what she was afraid of and show how we remade them into something wondrous. In all my life, such a project has never been so clear to me. I feel as though I have found my purpose once again. I feel that all the years spent mastering my craft and creative process was for this very endeavor. After many hours of defining the project and building the plan, I hope to launch a campaign to fund its creation in the next two months. If this book can inspire even just one parent and child to overcome fear by re-imaging the world, I will be happy. In a short period of time, I've endured so much. Yet through it all, I've had an amazing little girl right by my side, holding me tightly. I realize that at the end of the day, I am her rock. I keep painting what I see in my imagination. I keep getting up after I get knocked down. I keep trying new things. I keep laughing when its funny. I cry when it hurts, because she is watching. I speak now wrong of others, because she is watching. Even if it would be accepted by all that I stop, I keep going. Even If no one would fault me for taking a break because of all that I've endured, I keep going. Tyrone is an artist and human worth following and I am so glad he shared his story with us. All the best to you and your work Tyrone!